Do you have an epic idea? Share it! Panel 1: "A dark cloud looms over the horizon..."
Panel 2: "...and evil arises once more." Panel 3: "But we must stand, and fight!" Panel 4: "For the Kingdom!" Hammerhold is under attack once more! The goblinoid and orc hordes have returned to plague the kingdom, but they seem to be led by something... ...darker. Other parts of the kingdom, especially near Southport, have been reporting attacks by age-old foes. Our mages know naught of these strange forces and creatures among the armies, but they know that they are not to be trusted. Fortunately, the King has sent aid to help defend the city in case of attack. 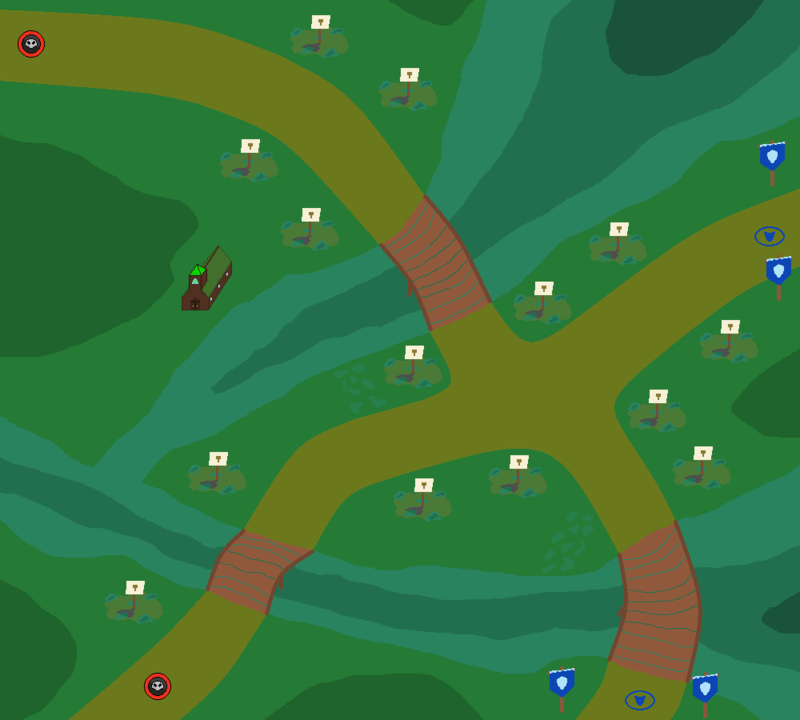 So, arm the catapults, ready the bows, and deploy the soldiers, for Linirea is under attack! The wall will block your vision of enemies for a short time. The wall has a prebuilt catapult on top of it. Slash n' Burn Defeat 300 Goblin Choppers. Law of Narrative Complete Stage 1. Siege Complete Stage 1 without building towers. We have driven the hordes back to the Zarafo Delta! We have set up camp at the river, to wait for the rest of our supplies to prepare for the crossing. However, the enemy knows we are making camp, and have begun raiding parties. Our supply chain is being disrupted, and morale is running low. We must attack the enemy before their force can starve us! However, a warning: the river is a dangerous place, especially during the springtime, when it floods. We must watch out for the deadly floods, even as we fight the goblinoid hordes. The river floods on waves 5, 8, 10, and 12. The flood will slow down all units and towers by 50%. Can be countered by a Big Wave. Any units in the path of the river with under 70 HP have a 50% chance to be swept away. When tapped on, the Temple has an option to send a barracks unit to the temple, removing them from the map and granting worship points, based on various factors. These points work as experience for the active god, as well as reducing the CD of the God Spell. Powers are upgraded from the menu. Pushes enemies backwards for the length of 4 strategic points. The effect also deals a small amount of true damage to all enemies affected. Use by tapping a spot and swiping toward the entrances. Balances the speed of all towers, making them fire at the speed of the fastest tower you currently have for 5 seconds. If a tower is upgraded to a faster speed during the time, it doesn't change the effect. The Ark Lose no soldiers to the floods. The trek through the dangerous Stonecliff Mountains has begun. The trek is long and dangerous, littered with pitfalls and rockslides. Luckily, the queen has sent a relief patrol that scouts say is close by. The men are much looking forward to it. However, before we could reach the relief camp, the goblins initiated an ambush! General, you must help hold the front lines! Rockslide: On every 3rd wave, an Orc Enforcer will walk down the middle area of the top part of the canyon. From this vantage point, they will throw 2 (+1 per appearance) rocks, each stunning any tower hit for 5 seconds. 451 Degrees Kill 451 Blazers. Cracked Crack open 250 Spikeballs. We Will Rock You Complete Stage 3 without having a tower stunned by a Rockslide. We have crossed the mountains, and come to the a safe spot, an alpine lake called Argent Lake. This lake is the main source of water in the Mountains, and a crossing point for traders from Linirea and Hammerhold. The water will be too cold for the goblins to cross, and we can quickly cross the lake. We have also hired some friendly farmer youths, who are quite skilled with their slingshots. While we had assumed the goblins would be unable to attack, they seem to have hired some disreputable folk to take them across the lake. 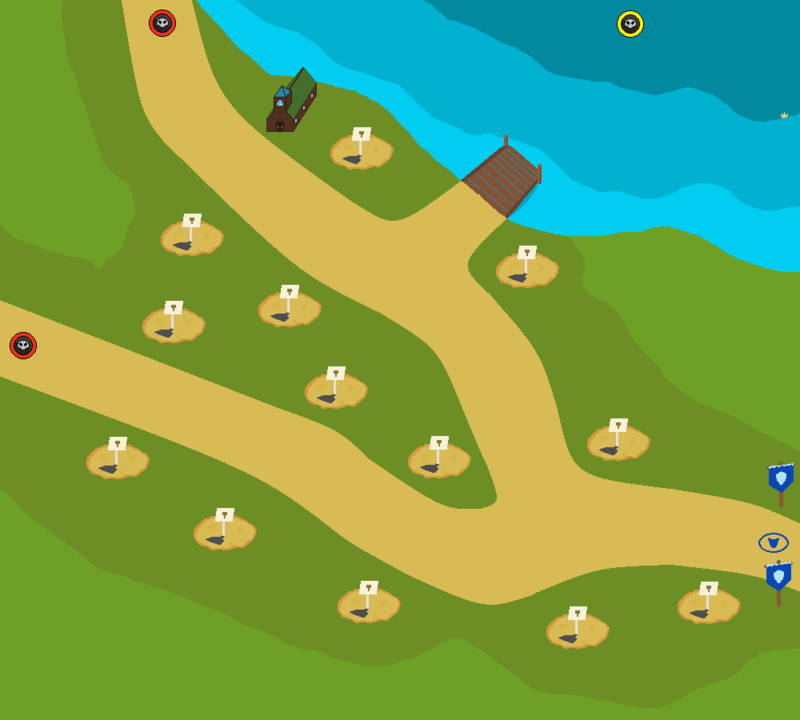 General, defend our camp! Boat Entrance: Boats will enter, and drop off troops on the dock. Each boat holds 4 non-flying enemies. The boats can be destroyed if they take 400 damage, but can only be damaged by spells or long-range towers next to the lake. Killing the boat grants full bounty of all enemies inside. Spreading Shadow Kill 50 Shadowmancers before they cast an ability. To the Bottom Sink 10 boats. Useless Find a useless fish. After leaving Argent Lake, we have received words of an imminent siege on the town of Pagras, and the queen has requested our assistance. We must go fast, and arrive in time for battle. The path we take is direct through what once prime wheat-growing territory, but has been destroyed by the goblin hordes. 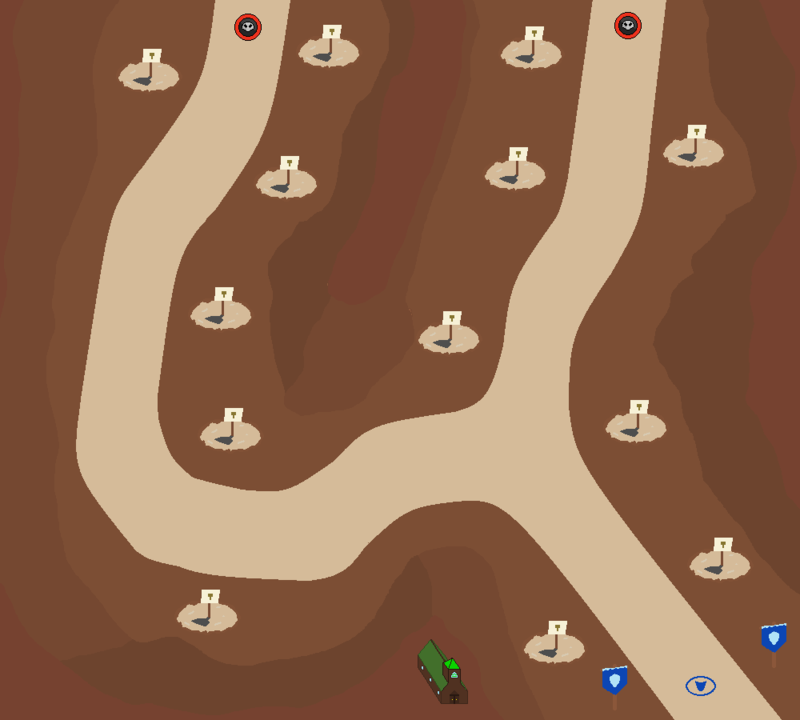 As we break camp, the scouts have sent word that a goblin patrol is harassing and beginning a scorched earth campaign on some farmers to the north. General, we must rush to their aid! We have come to the now Goblinoid town of Pagras! The queen's messengers has sent us reports that the Goblinoids have taken the town as their own. However, the area around the town is full of massive smoke clouds and an abundance of depleted coal mines. We can only assume they are building a massive weapon. Luckily, the Queen has sent us reinforcements, in the form of the Siege Breakers, a specialized company of artillerymen dedicated to breaking a siege, and their chosen weapon, the giant Onager. In addition, we have hired some local outlaws to help with the initial attack. General, we await only your command. Goblin Pillboxes: Sprays rounds of machine gun fire from its turrets, dealing 10-15 damage every second. Fires for 5 seconds, and every 20 seconds. Siege Breaker: Special units with 350 HP, 2-5 damage per second, and 60% armor. 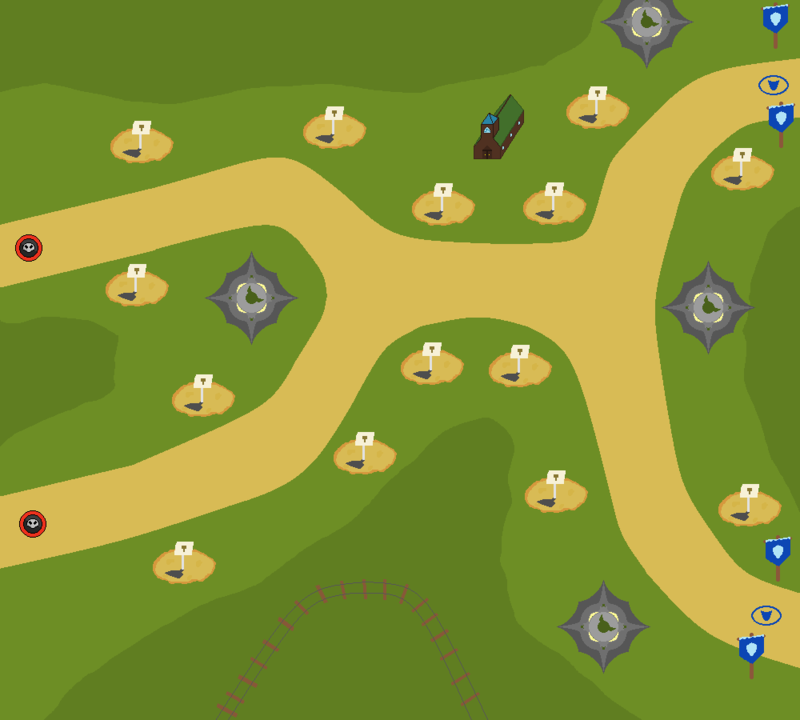 However, by rallying them to an artillery tower, they can be used as a buff to upgrade it by a level, for free. This consumes the Siege Breaker. There are 2 of them. After defeating wave 15, Pry'Niak will emerge from the SW entrance, heading for the NE exit. Tank Engine Find the blue train. Besieged Kill 100 units with the Siege Breakers. Panel 1: "Our lands have been freed..."
Panel 2: "...and we have found new allies to aid us." Panel 3: "Yet our enemies grow ever bolder..."
Panel 4: "...and so we must be in kind!" Our queen has sent us westward, to the Silveroak Forest, home of the Linirean Elves. Her motives remain unclear, however, we suspect we are headed to the outpost of Sildhel. Even when with an army, the woods are dangerous, and with enemies around every corner, especially a savage tribe that apparently lives even further west, so we must keep our eyes open for threats. A bit of good news, however. Our hunters have found some elven rangers skilled at finding and fighting the beasts that roam these woods. Some of the local men do not trust them, calling them "wraiths of the forest" or "phantom archers", but we feel their talents could go to good use. Bloody Monday Have Gatherers or Gliders gather blood from 500 units or towers. We have arrived at the glorious town of Sildhel! One of the only outposts of the proud elves, it still manages to have the "air" of an elven city, even in the middle of the deep forest. The elves always keep a guard on patrol in the city, however they are beginning to be overrun by Wild Tribe hordes. In fact, strange beings in dark cloaks, which seem to move without touching the ground, have begun to lead the army. This does not bode well. Luckily, the holy Priests, who mostly work in healing the forest from the many threats to its integrity, both inside and outside, have decided to help our cause. While they are skilled in combat, they prefer the clerical arts to the ways of battle. Sylvan Rangers: Looks like a combination of the aesthetics of the Sylvan Elves and the Ranger Barracks. Their troops also share the aesthetic. Represented by a dark green strategic point. Ranger Danger Kill 400 enemies with the Elven units. Dr. Moreau Have 500 enemies be transformed into animals via a Dark Priest. We have left the last safe haven of the forest, and have begun the trek into the Darkoak Swamp. Strange rituals are said to go on here, so we must beware. Even before we have made it a few kilometers, the swamp has claimed many lives. A dark mood has fallen upon the army. However, as we continue, we stumbled upon the ruins of a fire, clearly not made by native hands. And then, people, wearing the armor of knights, emerged from between the dark trees. They claim to have been part of a lost expedition to the Swamp, sent by King Denas himself, and want to join the army. The new members have brought a bit of our morale back, but we must hope it is enough, for the Swamp Tribes approach again! 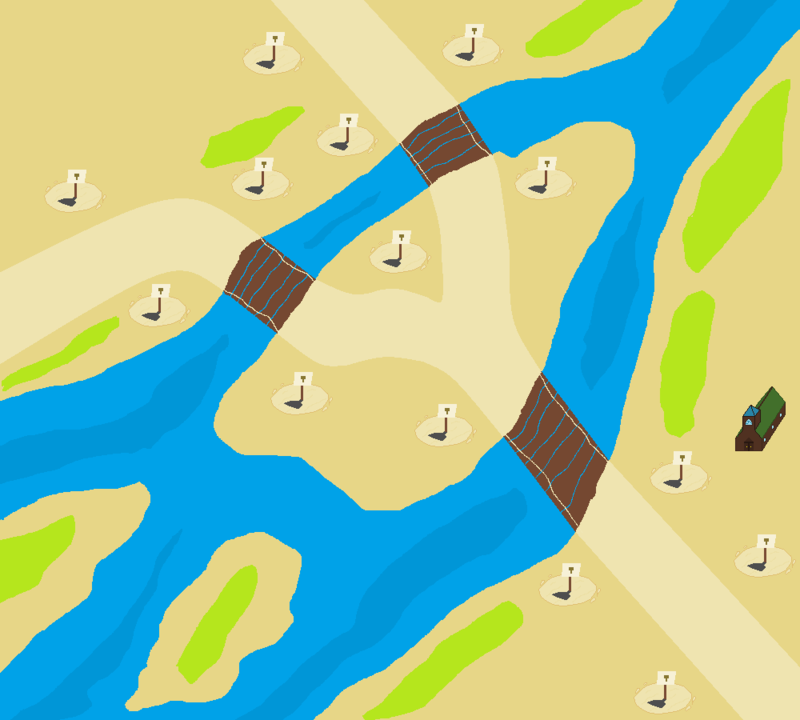 Swamp: Enemies will enter from the swamp. Enemies cannot be damaged in the swamp, unless they are engaged by Zealots. 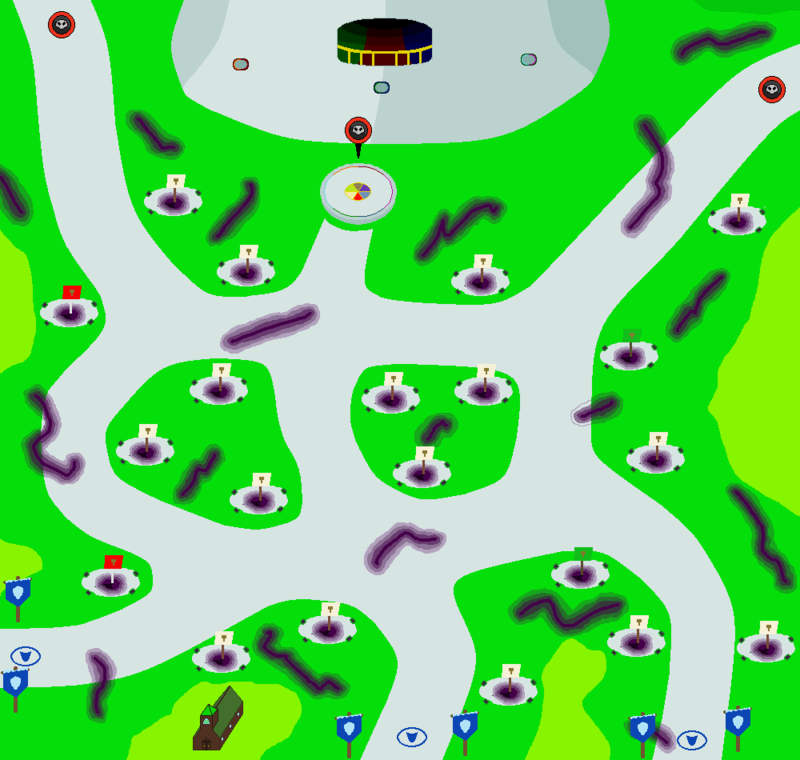 -The western swamp entrance leads almost directly to the southern exit. -The northeastern entrance leads down past the bridge before moving to the first chokepoint. Moist Kill 150 enemies before they exit the swamp. The trek through the swamp continues, with many men lost to the guerrilla attacks of the Swamp Tribes, especially their strange Transformed creatures. 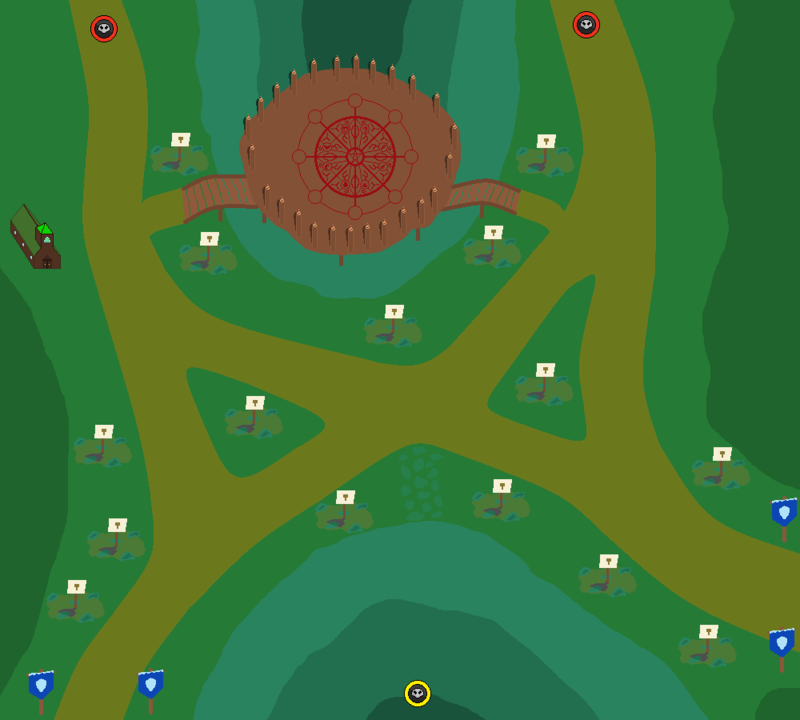 Our Zealots have reported that the main home of the Tribes lies not far southwest from here, but our men are tired and in need of rest, so we have stopped at a large temple in the middle of the swamp. Our surveyors have scouted some of the temple, and found many blood-stained surfaces, along with the skeletons of other humans. However, the surveyors also brought back pieces of broken technology, which our machinists say they can make into a usable weapon. And just in time, for the enemy has found us, and we have been surrounded! 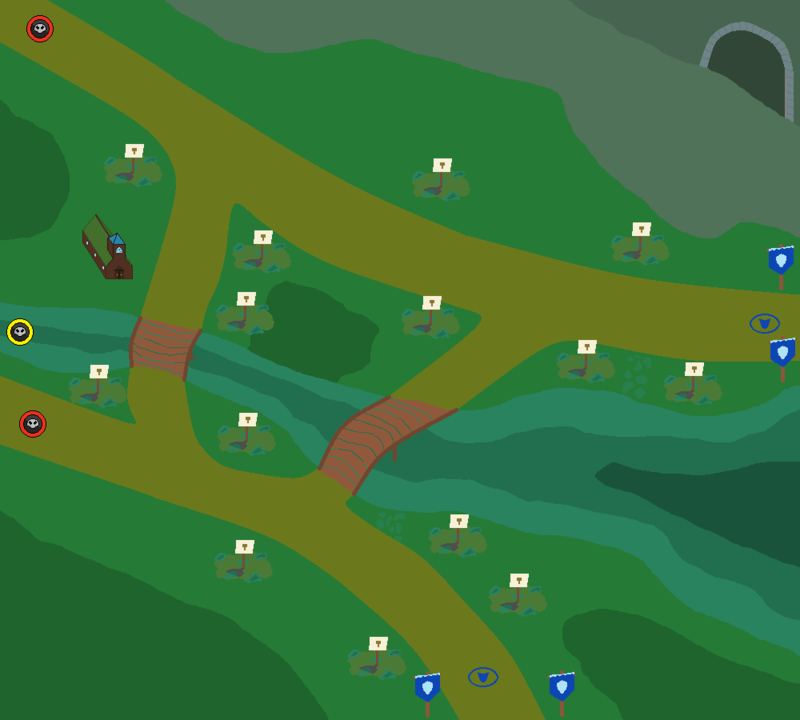 Swamp: The enemies will enter from the west, and go to either entrance, following the puddles to the north and south of the "lake" at the end of the river. Temple: Send explorers (75 gold) into the temple to come back with treasure. Maybe. Raiders of the Lost Ark Collect a total of 600 gold from the temple. Endangered Kill 100 Kebos with just magic attacks. The home territory of these savages is littered with corpses, both Linirean and of their own. They seem very interested in collecting large quantities of blood, and while we cannot be certain why, it sseems as if they want to summon... something. To this end, their shamans have taken up residence in a ritual circle. While we cannot disrupt the circle itself, we can attempt to stop the ritual. The Ravenous Spirit emerges from the either side of the ritual circle, heading to the corresponding exit. When killed, the shamans will attempt to resummon it. Each time it is summoned, it gains HP and attack power. The shamans can be killed either by towers or by units, but only when the Ravenous Spirit is active on the battlefield. If they are not killed, the Ravenous Spirit will respawn infinitely. Each Shaman has 400 HP. Killing one increases the HP of the rest by 100. Killing all the shamans wins the battle. Om Nom Kill the Ravenous Spirit. Fresh Meat! Collect meat for the butcher. Panel 1: "Our adventure has led us to an unknown land..."
Panel 2: "A land of promise, and a land of ruin." Panel 3: "May our gods protect us..."
Panel 4: "For this may be our greatest challenge yet!" We have recieved a distress call from the Dwarves and Elves! They request our aid in exploring a newly-discovered island to the south, which seems to be covered in a deep fog. What nightmares may lurk within we cannot be sure, and of course it would be a show of good will to aid them. The troops that were first to land report that the very ground beneath their feet is... strange. As if walking through shallow water, if that is at all possible. However, they also report that shadowed figures surround us on all sides. But we've come too far to turn back now. We must defend the landing site! Lanterns: Buy for 75 gold to extend vision through the fog. Rotten to the Core Kill 300 Plagued before they Engorge themselves. The Neverborn Kill 500 Daemons before they heal. Light Up The Night Light all Lanterns on stages 12-14. It seems that our old enemies, the Demons, have returned once again. 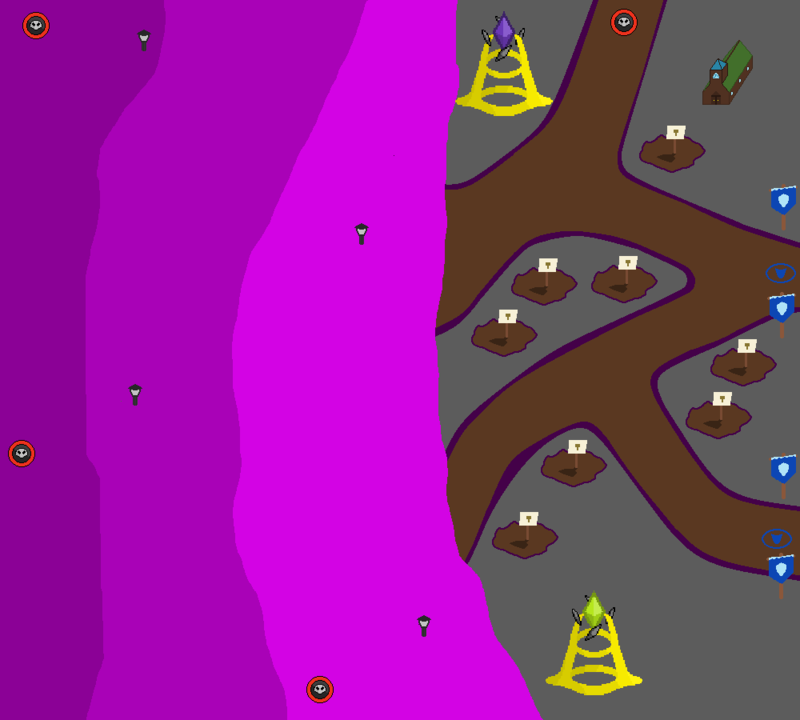 They are responsible for aiding Vez'nan many years prior, and despite beating them back to the pit from whence they came twice now, they persist in troubling us. Their fury makes them strong, but this shall not deter us. Destroy them, General. Additionally, our historians have discovered that, the Island's odd traits make it bear remarkable similarities to Isle of Zaagwen, which sank below the waves long ago. However, remnants of the grand civilization that once ruled these lands are discovered occasionally on the shores of our lands, indicating a catastophe may have destroyed them. Whatever tragedy befell them, may soon strike us, so be wary, General. Scream of Infinity Have Screamers scream 200 times. It is a dark day, General. Our scouting parties report two massive golden pedestals ahead, with a single gem floating atop each. Furthermore, each is surrounded by a nimbus of crystal shards, which seem to draw power from the gems. Our priests have begun to sense odd energies in the air around them, energies similar to those they themselves harness. The thought that our enemies may have access to the power of our gods is troublesome, to say the least. The fog has begun to clear a tad as we head further inland, but the enemy attacks have only strengthened. Assaulted from all sides, morale has dropped to an all-time low. Despite this, we must prevail, for our allies and homeland are counting upon us, and thus our enemies shall fall before our swords! Heresy! Find the mark of the Inquisition. Plane of Mind Kill 500 Lessers or Transcendants. We have come to the edge of the fog, only to find a massive shimmering tower reaching high into the heavens. The tower thrums with power, though of so many types that we cannot determine a single source. The ground quakes and glows, while the air has a constant haze to it. Whatever occult magics or technology are at the root of the tower, they pose a significant threat. The Transcendants gather at the base of the tower, and it appears as though their leaders have come to taunt us. However, all is not lost, as we have encountered expeditions from the Dwarves and Elves, who promise to aid us in the conflict to come. Surely it will be written in the books as one of the greatest battles. 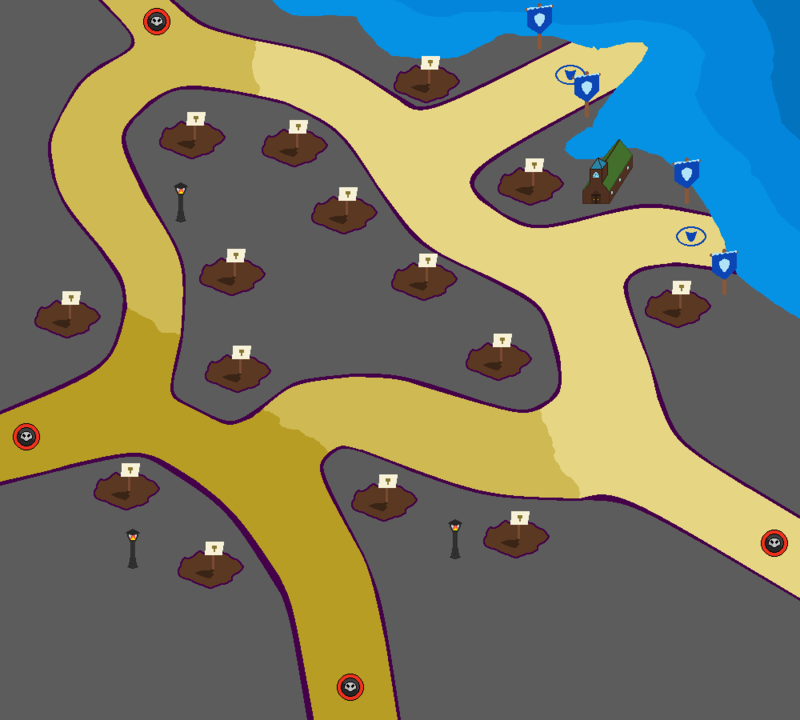 Allied Strategic Points: Towers placed on these points correspond to towers from the other races' tower sets. Left is Dwarven Towers, right is Elven Towers. Ruin Rifts: Any unit that stands atop these rifts takes 5 d/s, increasing up to 20 d/s the closer they are to the center. The main leader, Zivofis, leaves their taunting point, before arriving on the telepad at the base of the tower. It starts to walk toward the southern exit, while the other two leaders emerge from the entrances, heading for the nearest exit. You get an achievement, It's Over Defeat the Transcendant leaders. After killing the leaders, the orbs indicating their deaths fly into 3 niches on the side of the tower. It thrums with power, before unleashing a screen-filling white light, a la normal endings. When the dust settles, the true boss, Apotheosis, has appeared on the telepad. While you may seem absolutely screwed, your god, with what little power remains in their hands, has summoned an Avatar to aid you in your fight. Ability: Push: Summons a smidgen of godly power, to push away the nearest units, including Apotheosis. 10 second CD. The Avatar does not heal naturally, however, any Worship points gained after starting the boss battle will both heal it at a 40% conversion rate, and reduce its respawn, if dead, by 1 second per 25 points. Furthermore, for every 3000/3500/4000 damage dealt, Apotheosis loses control of a set of powers. For followers of Regnos, Apotheosis loses Regnos's, Sagate's, Elynie's, Ederus's, Zezzar's, and finally Cetuda's powers. For followers of Sagate, Apotheosis loses Sagate's, Regnos's, Zezzar's, Elynie's, Cetuda's, and finally Ederus's powers. Upon the fight's conclusion, Apotheosis explodes, releasing the screen-filling white light once more. And yet, despite the corpses of the other two leaders behind them, the main leader, Zivofis, lives, barely, and begins crawling toward the exit. The Avatar at this point has disappeared, but the leader is unblockable. Red Stones Find the Philosopher's Stones. For the Alliance! Upgrade towers on the special spots to L4. Design: A single bowman residing in a castle-like turret, with a large bow a few times their size. Description: These specialized archers are trained to target enemies from long distances. "My sight is that of the falcon!" "May my bow rain death!" Effect: If an enemy is stalled while in range of the tower, and the tower has already hit the enemy, the tower will begin to fire at a fast rate against that enemy. Design: Two people now reside in the tower. The tower is now taller, with one person firing and the other spotting with a telescope. Description: A pair of soldiers, trained to spot and fire at targets massive distances away. Design: The tower itself doesn't really change, but the archer now wields a compound bow. Description: Now armed with a fancy compound bow, far away targets will never be a problem. Design: Two slingshotters are in a large tree. They fire small stones from slingshots. The slingshotters are youths. Description: These expert slingers can kill any enemy, large or small. Build Quote: "9 skips? New record!" Effect: Per shot, has 20% chance to skip to the next enemy in a line. This chance can repeat itself up to 9 times. Automatically bounces to boats. Written Quote: "Bird is the word." Effect: Fires a bird, which has a special ability. The chance for each is equal. Now, with this upgrade, a large catapult is present in the middle of the tower. -Purple: Fires a bird which speeds up to highest hp enemy in range, dealing 100-140 damage. -Orange: Splits into 3 birds which deal 30-55 damage each. -White: Fires an explosive bird dealing 70-160 AoE damage. Spoken Quote: "Get off my lawn!" Effect: If a stone skips, hit enemies take 15%/30%/45% more damage from the next slingshot attack. Lasts for 3 seconds. Design: Two rangers inside a small tree, like the normal Rangers. However, near the ground, strange hollow trunks send out puffs of green gas, and the eyes of the Elves can be seen, and they glow bright green. Description: Trackers deadly to human and beast alike. Build Quote: "Like a ghost..."
Effect: Inflicts a status effect on enemies when they are hit. Tracked enemies cannot become invulnerable and suffer a 10% reduction to armor and magic resist. Lasts for 4 seconds. Spoken Quote: "Kneel before me!" Effect: Tracked enemies have a 4%/7%/10% chance per second to come to your side for 2 seconds. Chance to be activated increases to 8%/14%/20% when in combat. When activated, the hunter's eyes flash white. Cannot occur more than once every 10/8/6 seconds. Written Quote: "Doom falls on you." Spoken Quote: "You are one with the spirits!" Effect: Insta-kills an enemy, turning them into a spirit for 6/12/18 seconds. Each spirit broadcasts an aura, like a totem, in an AoE about the size of Burst Arrow. 150-499 HP = Slow nearby enemies by 20%. Design: A simple tent-like structure, with a banner in front. The banner depicts a single sword. A change from previous games is that the soldiers might have a different skin tone and hair color from each other. Description: Newly drafted men, freshly trained and ready to fight! Design: The tent is now a little bigger, with two banners in front. The soldiers still have no helmets, but now wear light mail armor. Description: Infantry are better trained then conscripts, to better handle threats to the kingdom. Design: The soldiers are now equipped with wooden shields. The tent is a lot larger, the kind that would go over a pavilion. A new banner is hung from the top of the tent. Description: Commandos have been selected out of the ranks of the conscripts as the best, and therefore have the best training and equipment. Design: An old-timey western saloon/bar. Three outlaws with appropriate gear are spawned. Description: These scruffy outlaws are some of the toughest in the kingdom, armed to the teeth with pistols and knives. Build Quote: "This is a robbery!" Effect: Is ranged. The pistol fires every 0.5 seconds, and fires 3 shots per clip. Reloading takes 3 seconds. Stabs with a knife in melee every second, but will prioritize shooting if reloaded. Written Quote: "Mo' ammo, mo' problems." Spoken Quote: "Six shots, six kills." Effect: Has 4/5/6 shots when firing. Spoken Quote: "See ya at high noon!" Effect: Stuns 1/2/3 enemies for 0.5/1/1.5 seconds as all alive Gunslingers instantly reload and fire 1/2/3 bullets. Spoken Quote: "Stop, drop, and roll." Effect: Gunslingers gain a 10%/20%/30% dodge chance. Instantly reloads when dodging. Design: A more rounded tent structure, with a lookout post on top. The soldiers spawned wield dual machetes, and are clad in light chainmail. Description: These knights may not be the most honorable, but they are expert fighters in difficult terrain. Build Quote: "Movement penalties you say?" Written Quote: "Slice and dice." Effect: Equips a ranged weapon which either deals heavy damage or hits multiple enemies. Both can hit air units. Changed through a button opposite the rally. Both fire every second, with a long range. Written Quote: "A blind enemy is no enemy at all." Spoken Quote: "Go for the eyes!" Effect: Slices an enemy in the face, slowing their attack by 5/10%/15% permanently. Stacks up to 75%. Written Quote: "My life for Linirea." Spoken Quote: "Bring it on!" Effect: Charges at enemies in close range when attacking. Level 2 stuns the enemy for 1 second, and L3 executes an instant Dirty Strike, unaffected by CD. Design: A red and gold cloaked mage, with fiery red hair stands on top of a tower. The tower is a bed of coals, and the mage is barefooted. To attack, they summon a small ball of fire. Description: A low-ranking fire mage, who summons small fireballs to throw at enemies. Effect: Burns at 2 d/s for 5 seconds. Does not stack. Design: The mage looks the same, but the tower now has a ring of braziers around the top, and they are lit. The mage will now summon one fireball, prepare to throw, and at the same time summon another. This cycle repeats in the firing animation. Description: A fire mage moderately skilled in the arts of fire-wielding. Effect: Burns at 4 d/s for 5 seconds. Does not stack. Design: The mage looks the same, but now, the braziers are replaced with the entire top of the tower being lit in blue flame. To attack, the mage will hold their hand out towards an enemy, and a fireball will move from the circle of flame toward the enemy. Description: The best of the fire mages feel no pain from flame, no matter how hot. Effect: Burns at 6 d/s for 5 seconds. Does not stack. Design: The tower itself is very similar to the sorcerer mage, but has some differences, as these mages harness the sun's fire. The rock is blackened in places, and an orb like a small star hovers above the mage's head. The mage wears red-orange shimmering robes, and to attack, takes plasma from the orb, black hole style, and fires a fire comet. Description: A branch of the Stormcloud Sorcerers, Sunsfire Mages concentrate the sun's heat to burn foes. Build Quote: "Now you burn!" Effect: Deals 10 fire dps for 5 seconds. Any enemies killed by the fire damage spread the fire to nearby enemies. The effect can chain. Effect: Fires a series of solar rays at enemies. These rays deal 50-100 true damage apiece, and if hit by 7/5/3 rays, an enemy is insta-killed. The AoE of each is about that of a normal artillery AoE, and 7 rays are fired at a time. Represented by a column of orange light streaming down from the sky. Spoken Quote: "Purge by fyre!" Effect: Creates a solar storm, which strips enemies of 20%/30%/40% magic resist and deals 200-300 true damage. Design: A single Priest, with long white hair and a white with gold detail robe stands on a large hunk of marble-like rock. 7 crystals jut from it, one in each color of the rainbow. The Priest will chant, and hold their hand outwards to fire a white bolt of magic. Description: Magic wielders of a holy order, they can restore vitality to our soldiers at the cost of that of the enemy. Effect: For each shot, the nearest soldier with the least health will get 50% of the attack's damage in health. Present as a green orb flies from the hit enemy to a soldier. Effect: Burns at the same rate as the Firebender mage. Deals double damage to magic-resistant enemies. Written Quote: "Fall before the light." Spoken Quote: "I shall purge your corruption!" Effect: For every 200/150/100 HP healed, the Priest silences an enemy for 7 seconds. Written Quote: "The crusade calls." Regnos' warrior is clad in blue-purple armor with silver highlights. The armor has smooth, flowing shapes. Sagate's warrior is clad in translucent white armor with gold highlights. The armor has sharp shapes. At level 3, Regnos' warrior gains a 30% dodge chance, and Sagate's grants an aura to nearby soldiers, boosting max HP by 20, and damage by 4 points. If the Warrior is alive, the healing orb hits both a normal soldier and the Warrior. Design: A simple catapult, armed with a large rock and serviced by two humans. Description: The siege catapults have been a reliable tool since the Kingdom's foundation. Design: This catapult is now powered by torsion, so it fires bigger rocks. Description: A torsion catapult is able to fire heavier payloads further because of its propulsion system. Design: The trebuchet uses a massive hunk of metal as a counterweight, and the rock it fires is also bigger. Description: One of the largest of normal siege engines, the trebuchet will smash your enemies! Design: A gigantic catapult, with torsion ropes as a power source. A boulder easily the size of a hero is loaded into it and fired high up into the air. Description: The largest catapult ever concieved, the Siege Onager fires boulders the size of larger Goblins! Written Quote: "Special for a reason." Effect: Fires either a corpse or flaming hunk of rock. When they land, they can either poison or burn nearby enemies at 5/10/15 dps for 5 seconds. At level 3, the poison can be spread by enemy-to-enemy contact, and if an enemy is killed by fire, they explode, dealing 100 AoE damage. Written Quote: "Break 'em down." Effect: Fires an incredibly large rock, dealing 2x/3x/4x normal damage in a larger aoe and shattering 25%/50%/75% of armor. Design: A large tower, mainly comprised of two wooden logs, along with an axle at the top. A catapult arm is positioned on the axle, and a bunch of gears lead up from the bottom to it. Two machinists at the bottom load rocks into the catapult and spin a crank, which then turns the axle. Description: A strange contraption which can fire rocks with increasing velocity over time. Build Quote: "You spin me right round." Effect: If the engine is kept spinning (i.e. it keeps firing over multiple reload cycles) its speed and range increase. -0.2 seconds of reload and +1 range level per 2/4/6 sequential shots, to a maximum of 0.4 seconds reload and Extreme range. Each level decays after 3 seconds of non-firing, 9 total. Written Quote: "Sand in your eyes." Effect: Fires a projectile of sand, which explodes in the AoE of a Burst Arrow. The sand lasts for 4/7/10 seconds, and slows by 20%, while also reducing attack damage (while in the cloud) by 50%. Spoken Quote: "Darned sneaky pebbles." Effect: Fires a layer of spikes, which land on the ground near the tower. Each layer deals 10 d/s to enemies that walk over it, and slow for 5%. Stacks. Lasts for 60 seconds. Does not require nearby enemies to be used. A famous legionnaire, Scipio fights at your side for the glory of the kingdom, and of course his own. Hero Portrait: Scipio stands in formation with his shield in front of him and sword in hand. Appearance: Scipio wears normal legion armor, with a large red plume, and wields a giant sword. Has a 25% chance to deal double damage. Thrusts forward for 15/25/35 physical AoE damage in a straight line. -Lance: Arms Scipio with a lance, making Stab deal damage in a longer AoE. -Heart Strike: Stab only hits one enemy, but deals 40 true damage. Deals 75 physical damage and knocks back the target a short/average/long distance. -Block: Grants an extra 30% armor for 3 seconds after using Heavy Slam. -Push Them Back: Heavy Slam hits multiple targets. After 5 idle seconds, Scipio creates Earthworks in front of him, slowing enemies in the area by 50% and dealing 5/10/15 d/s to enemies in the area. Persists until he moves. -Earthmover: Earthworks affects a larger area. -Ballista Trap: If enemies are affected by Earthworks, fire an explosive bolt dealing 50-100 aoe true damage every 5 seconds. Scipio's presence makes nearby towers deal 10%/15%/20% more damage and cost 5% less to upgrade. -For The Kingdom: Reduces upgrade costs by 15%. 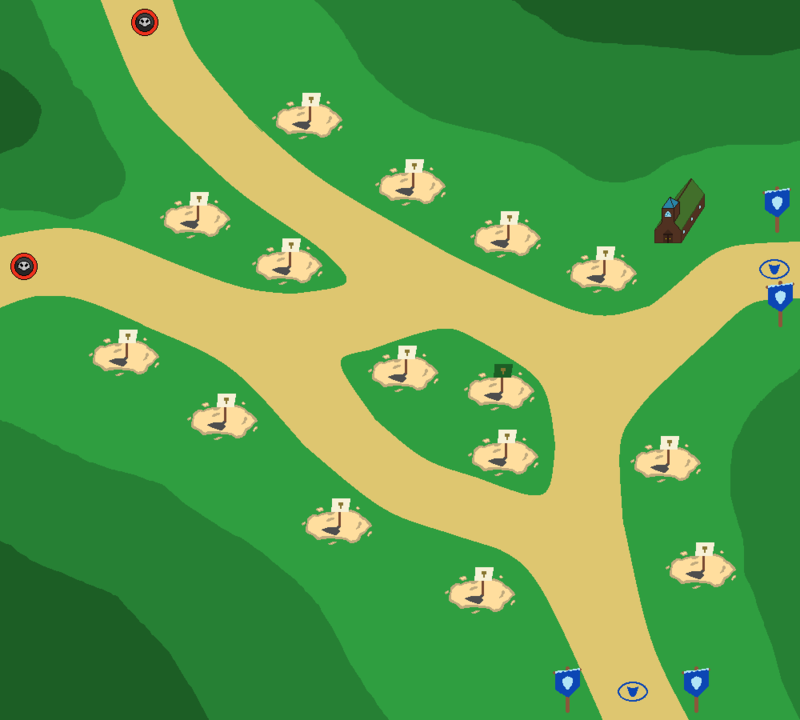 -Fortifications: Each tower in range of Glory of Linirea spawns a soldier equivalent to your highest level barracks. Lasts for 30 seconds. They are armed in simple legion armor, gaining a 10% boost to armor for every other legionnaire present. -Lock Shields: Armor buff is increased to +15% per legionnaire. This boost also applies to Scipio. Stacks up to 90%. -Centurion: Scipio grants an aura to nearby soldiers, increased their HP by 100 and armor by 25%. Determined to prove herself, Nyssa has joined our army on its long trek, and with her powerful witchwork, our enemies will fall! Hero Portrait: Nyssa holds her arcane staff in her portrait, though most of her face is covered by an overlarge hat. Appearance: Nyssa wears the long robes of an Arcane Wizard, with a long, purple-crystal-tipped staff, as well as golden script all over her robes. She wears a large purple hat. Adds 20%/40%/60% magic resist. Depending on the last attack, there is a 50% chance that the shield modifies itself to better resist the attack. -Ever-change: Shield consistently changes to resist attacks. -Barrier Magic: The alteration effect applies to the armor of nearby allied units. 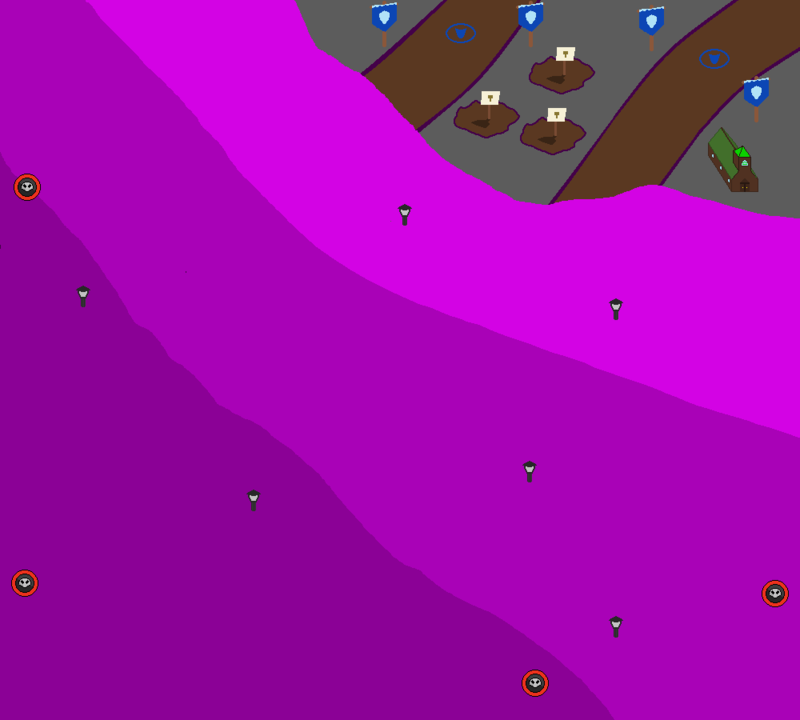 Summons 1/2/3 Shadows, which run beneath the ground (evident as a purple blob) and then attack enemies from below, dealing 75-100/125-150/175-200 magic damage, and trapping enemies for 1 second. -Dark Grip: Traps for 1.5 additional seconds. -Dark Infusion: Summons 4 shadows. When lacking a target, shadows may hit barracks, increasing their attack damage and speed by 100%. -Death Sweep: Death Ray nows hits in an AoE arc, but the CD is increased to 25 seconds. -Death Magic: Nyssa's basic attacks gain a 6.25% chance to IK. -Thaumic Destruction: Reduces stats by 50%. -Lifesteal Glyph: Thaumic Alteration deals damage equivalent to 10% of an enemy's HP, healing Nyssa for the same. Can be targeted to either the path or towers. If targeted on the path, enemies get teleported backwards, as in the Arcane Wizard's special. 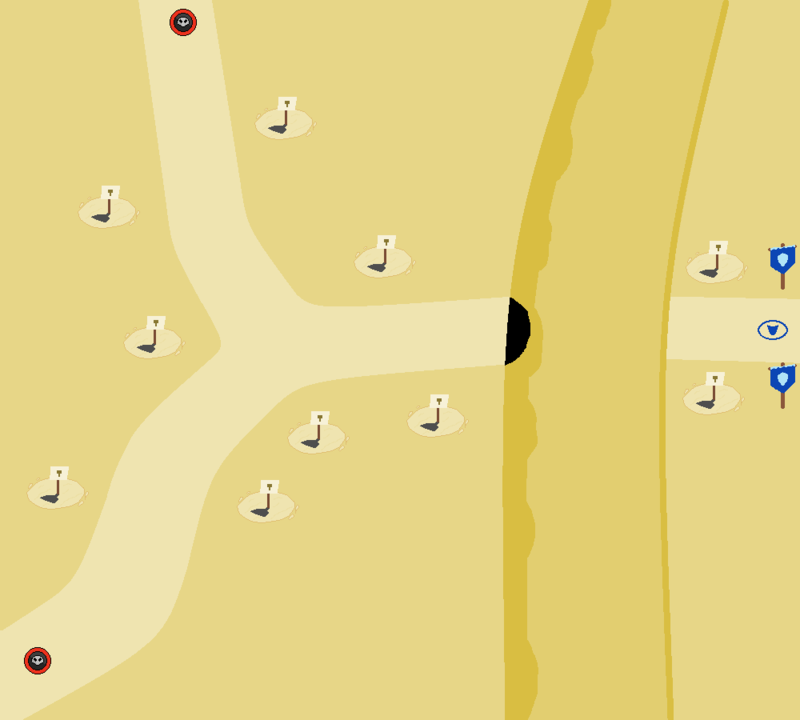 If targeted to a tower, the tower can be moved to a different location by tapping an empty strategic point. -Mass Teleport: Hits enemies in a much larger AoE, and moves them further. -Arcane Warp: When used to move a tower, Teleport's CD is reduced to 10 seconds. They are the absence, they are the whispers in the dark. Permanently invisible. Melee range is much shorter than any other unit. Throws a smoke bomb which stuns enemies in a small/medium/large area for 2 seconds. -Pervasive Smoke: Smoke slows enemies by 50% for 2 seconds following the stun. -Flash Bomb: Stun duration improved to 3.5 seconds. Fires 2/4/6 stars in rapid succession at an enemy. Each star still causes Whisper to teleport. Does not switch targets. -Ninja Master: Fires 8 stars. -Weakening Stars: Fires 4 stars at multiple enemies, but each reduces attack damage by 5%. Stacks. Throws a bomb which creates a patch of burning flame. Burns at 8/16/24 d/s for 5 seconds. The patch lasts for 3 seconds. -Sticky Fire: Burn duration increased to 10 seconds. -Explosive: Deals 50-75 initial AoE damage. CD lowered to 10 seconds. Each attack from Whisper decreases an enemy's movement speed by 1%/2%/3%, stacking up to 60%. Abilties decrease move speed by 10%. -Fear of the Dark: Enemies are slowed by 4% per star from Whisper's basic attack or Starstorm. Increases stack cap to 80%. -Fear of the Light: Enemies are slowed by 20% per use of Smoke Bomb or Conflagration. Increases stack cap to 80%. Summons 1/2/3/4 Shadow Doubles, which takes up residence on nearby towers or on the side of the path and fire 24 stars (2 per throw). The stars deal 1/3 the damage of Whisper's current ranged damage. CD begins when they disappear. -Shadow Storm: Shadows fire 6 stars per throw. Increases stars thrown to 30. -Shinobi Tactics: Any tower with a resident Shadow Double gains +100% attack speed and damage for the duration of the ability. Adds 1 Shadow Double. While we believe she has gone mad, there is no doubt that Perditia's skills are useful in times of war. Hero Portrait: Perditia stands mid frame, throwing a grenade up into the air with one hand and ready to pull the pin out of another with her teeth. Appearance: Perditia wears light combat plate, modern-military style. She holds a gun which fires grenades, and has a backpack full of them as well. Ability grenades are grabbed from the pack. For a 1.5 second window after each basic skill is used, Perditia's Hero Spell gains additional power. This only applies to one thrown ability grenade per cast. Throws a heavy grenade, which lands on the ground. After 1.5 seconds arming, it explodes for 50-100/75-150/100-200 damage in large area, stunning hit enemies for 0.5/1/1.5 seconds. -Blinding Blast: Enemies move at 50% speed for 3.5 seconds after detonation. -Mass Obliteration: Using an Obliteration-boosted Exterminate instantly resets Obliteration's CD. Throws three basic grenades in rapid succession, in successively longer throws. -Shredder: Shreds 20% of armor on affected targets. -Mass Eradication: Using an Eradication-boosted Exterminate instantly resets Eradication's CD. Fires a shrapnel grenade that deals basic damage, and increases in damage by 10% for every 10% of missing enemy's HP. -Marked for Death: Enemies that survive Annihilation recieve double damage for 1.5 seconds. -Mass Annihilation: Using an Annihilation-boosted Exterminate instantly resets Annihilation's CD. Each boosted hero spell increases Perditia's stats. All of these stack infinitely. Using an Obliterate-boosted HS boosts her basic attack range by 5%/10%/15%. Using an Eradicate-boosted HS decreases her basic attack reload by 5%/10%/15%. Using an Annihilate-boosted HS boosts her basic attack damage by 5%/10%/15%. -Master of Pain: Killing at least 5 enemies with Exterminate grants all bonuses. -Master of Destruction: Each boost is increased to +20%. Drops a grenade dealing 50-100/100-150/150-200/200-250 damage in an area. -Assembly Plant: Boosting Exterminate reduces its cooldown by 10 seconds. These shock troops wield hatchets, which chop through wood and flesh alike with ease. Death Animation: Falls on its face, with the axe twirling in the air and then hitting the ground. Appearance: A simple goblin, equipped with a bloody axe, like the Orc Champions. Notes: While they do have high-ish HP and high damage, they are easy to defeat. These lightly armored orcs have deadly brass knuckles, as to increase the power of their already strong punches. Death Animation: Falls flat on the ground. Appearance: A large orc, midway between orc and ogre, equipped with simple armor and brass knuckles. Notes: Mages are better, but it doesn't really matter. These mutated goblins have the ability to take flight. -Falling: Deals 50 AoE damage on death. Death Animation: Falls to the ground, turning to stone. Appearance: The Alar is a simple flier, but it looks like a Goblin with wings. Nothing is wrong with that. Notes: Just a flier with a death effect. These changed worgs have the ability to stiffen their fur and fire it at nearby enemies. Death Animation: Shatters like glass. Appearance: A simple worg, but they have light-blue eyes and the ability to fire quills at nearby enemies. Notes: Because of their AoE power, these worgs are dedicated anti-barracks. They are best killed with artillery to avoid the magic resist. The most pyromaniacal Goblins are equipped with flamethrowers and sent into the heart of the fray. -Burn: Applies a burn at 5 d/s for 3 seconds. -Burning: Immune to burn damage. Death Animation: Burns to a crisp. Appearance: It looks similar to the Zapper, but it is dressed in a flamesuit and has a flamethrower. Notes: A simple enemy, like the Burner, but buffed. Goblins rolling around in a spiked metal ball. -Crush: Deals 10-20 damage to troops it runs over. -Escape: Creates an Goblin Chopper on death. Appearance: Nothing more than a giant metal spikeball. Notes: Due to its high armor yet low HP, mages are critical. This giant will combine itself with pieces of old giants, creating a new monster capable of using the powers of both. -Mist: Summons a mist which deals 5 dps to enemies and heals 5 dps for allies. -Mist-ical Summon: Summons a cloud which quickly disappears, revealing 2 Choppers, 1 Enforcer, or 1 Blazer. Death Animation: Clutches its chest, falls, and splits apart, creating a glowing white-blue light, and then it disappears. Appearance: A shaman who has a darker green skin then usual, and the mask is black. The staff is a dark metal pole, which the Orc shakes to summon a dark cloud. Notes: A relatively annoying summoner, who is also a healer and a poisoner. Yay. Massive ogres with in-built artillery. -Barrage: When within range of a barracks, it will fire 2 cannonballs, dealing 20-30 damage apiece, and stunning for 0.75 seconds apiece. Death Animation: Falls to the ground in a smoldering heap. Appearance: A large ogre, with cannons welded to its shoulders. Transports used to deliver troops to the front line. 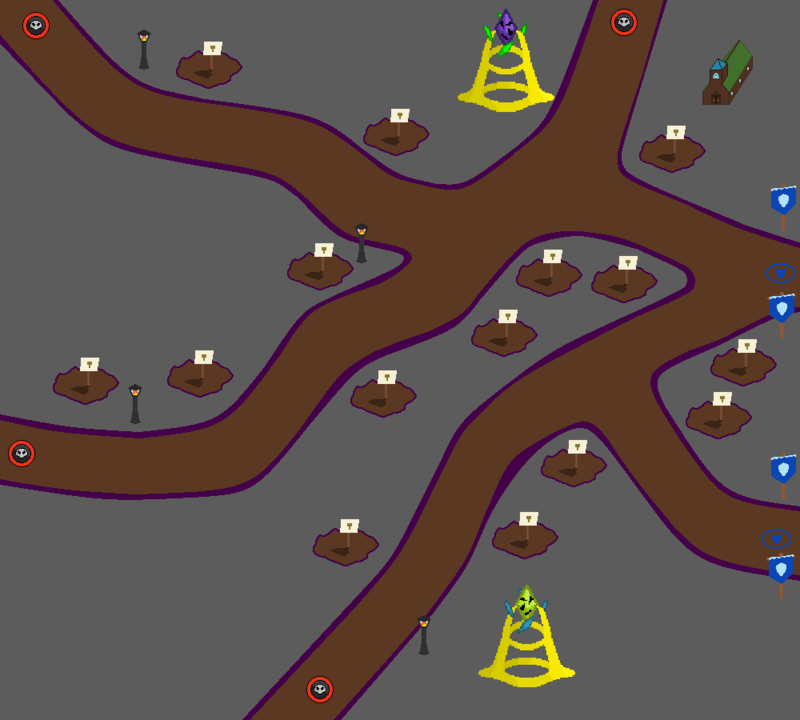 -Invulnerable: Burrows underground like a Dune Terror. 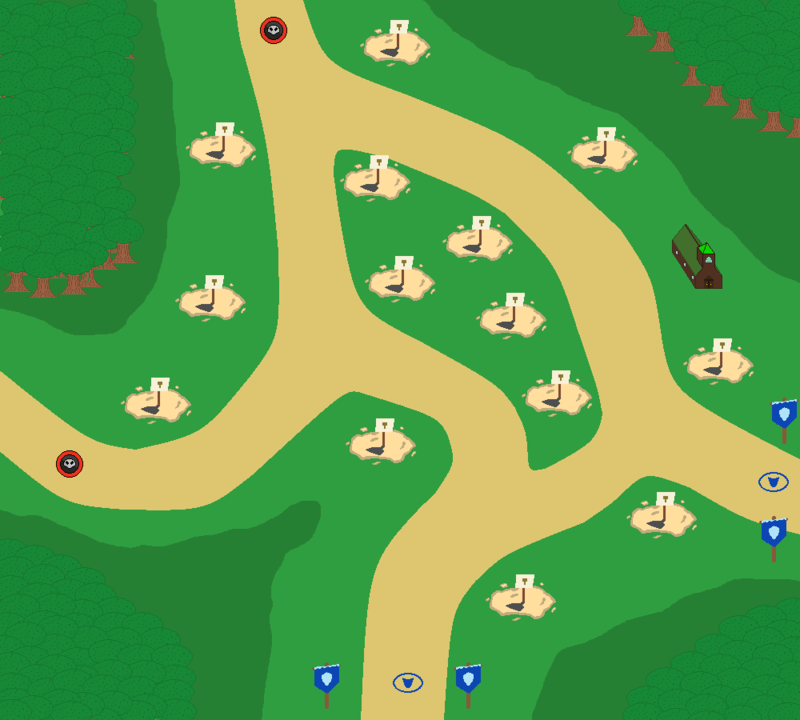 -Deploy: When it reaches a barracks, it will continually release new enemy troops every 3 seconds until killed. Appearance: Literally a tunneling drill with a door. Newest lord of the Goblins, Pry'Niak is said to have... ...sponsors. He commands a, well, commanding mech. -Plasma Ball: Stands still for 2 seconds, forming a plasma ball with his mech hands. He then either throws it at a tower, disabling it for 8 seconds, or rolls it down a lane, dealing 300 true damage to any ground units. Used every 8 seconds. -Unblockable: After escaping from the mech, Pry'Niak cannot be fought by melee units. Death Animation: The mech begins to explode and crumble, but Pry'Niak runs out before its final collapse/Pry'Niak falls to the ground, dead. Appearance: A large mecha, with giant arms, but no head. Pry'Niak is held inside a small, blue tinted glass orb in the chest area. When out of the mech, Pry'Niak is little more than an ordinary goblin, albeit with one of those fancy motion-capture suits. Notes: A relatively simple boss, though Plasma Bowl can cause a kink in your strategy. The Wildlings hunt for sacrifices to their gods, and will not falter, as their gods demand. -Blood for the Gods: Deals +3 more damage for every 10 points less than max HP a foe has. Stacks up to 30, but resets when fighting new enemies. 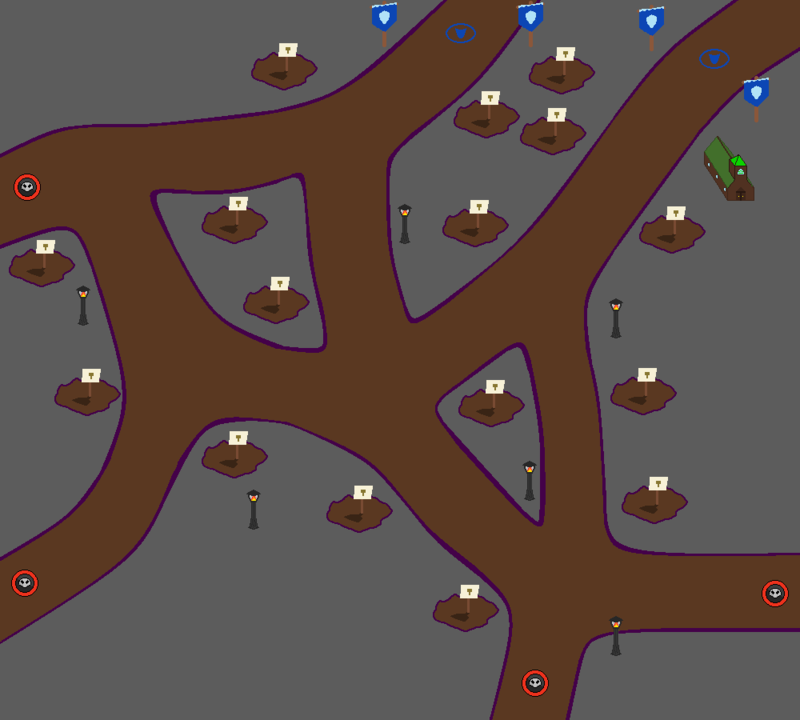 Death Animation: Vines erupt from the ground, encircle the body, and drag it underground. Appearance: Similar to the savage warrior, but it has a more pointed and angled mask, looking somewhat reptilian. It has two hidden knives in its hands, like the Assassins. Notes: Deadly against high-health heroes and barracks. Knife-obssessed savages skilled in hunting, animal or human. -Pin Down: Deals +1 add. damage per previous attack from a Knifenut on the target. Death Animation: Similar to the Wildling. Appearance: A short and squat Wildling, with a frog mask and a bandolier of knives. Notes: Pin Down can stack quite quickly. They draw strength from blood, and take it from our soldiers. -Gather Blood: When fighting a soldier, the Gatherer can gain 50% of the attack and damage of the soldier. 10 second CD. Death Animation: Falls onto the ground, impaled by its own knife, before being sucked under. Appearance: Wears a snake-headed mask, and holds a long knife. A bandoleer of blood vials/bottles is visible. Notes: This enemy must be kept away from soldiers. Otherwise, it isn't hard to defeat. An entity of strange magics, who changes its allies into monsters. -Transform: Transforms an ally. Used every 7 seconds. -Consume: Turns an soldier to red dust, gaining HP equivalent to 1/3 of the unit killed. Usable every 12 seconds. Death Animation: The staff glows, before it begins to be consumed by red particles, along with the rest of the priest. A white orb is all that remains, which quickly disappears. Appearance: Wears a cloak, with a red-gem tipped staff. Has a heron-headed mask. Notes: The first real tough enemy to defeat. High HP, a healing method, magic resist, and another ability. Pound it with archer shots, preferably Tracker. A Transformed creature that spits deadly acid. -Acid Pool: Attacks create acid pools that deal 10 d/s but cannot kill. -Acidic Death: Burns away all armor around it on death. -Transform: Transformed from the Knifenut. In the animation, the Knifenut grows shorter and fatter, with its skin turning rugged and a green color. Death Animation: Croaks, before exploding, spraying acid. Appearance: A large toad with many protrusions, as well as bulbous acid sacs and bright red eyes. Notes: While it isn't hard to defeat, its abilties can cause chaos in a fight. Airborne Gatherers, deadly in packs. -Jump: Can jump at a non-barracks tower, gaining 200 HP and 50% of the tower's attack damage. This "kills" the Glider. -Ground: After dying or jumping, the Glider becomes a Gatherer. Death Animation: The glider wings fall apart, and the Gatherer jumps. Appearance: Same as the normal Gatherer, just with a pair of leaf wings attached to its back. Notes: Like the Gatherer, attempt to kill it fast. A Transformed creature that hunts in shadows and preys upon the weak. -Feast: Attaches itself to a tower for 1 second. After the time period, it stuns the tower for 4 seconds and boosts its own speed for 4 seconds. 10 second CD. -Fell Swoop: If it passes over a soldier with less than 30 HP, it swoops down and insta-kills it. This heals the Bloodsucker for 10% of its HP. -Transform: Transformed from the Glider. The animation is that the glider's wings grow longer and more bat-like, as well as its body growing shorter, so it becomes a giant bat. Death Animation: Burns to ash. Appearance: A large bat, with leathery wings and a furry body. Large, protruding fangs are visible. Notes: If a large group of these enemies are made/spawned, you have problems. They are moderately strong, but chiefly is their tower stun. It can cause problems, especially among low numbers of towers. A Transformed creature which can eat anything that opposes it. -Eat: Insta-kills a unit, gaining their 50% of their max HP in health, but moving at slow speed for 6 seconds. 10 second CD, can affect heroes. -Transform: Transformed from the Gatherer. The animation is that the mask, which is made of bone, turns into the creature's face, and its body lengthens to become a giant snake. Death Animation: Eyes go to X's, before falling on its side. Appearance: It's a snake. What do you expect? Notes: While it has no resistances, it's speed combined with high health can make it pass through defenses quickly, and when it gets to a barracks, it can heal a lot, especially if it manages to kill a hero or a Zealot. A Transformed creature, with very tough skin and a very strong bite. -Bleed: 25% to cause heavy bleeding (10 d/s for 3 seconds) on each attack. -Transform: Transformed from the Wildling. The animation is that the mask falls off, as the face becomes crocodilian, and its body turns green, with scales. It drops the knives, but in turn gains large teeth. Death Animation: Falls to the ground, dead. Appearance: An angry storm cloud. What more description is necessary? Notes: While it has no abilities of note, remember that these things will be spawned relatively frequently if a Dark Priest is around, and it is no pushover, with heavy armor and high damage. An avaricious being of pure hunger, it desires only to consume. -Hunger Aura: Heals for 30% of damage dealt. -Resummon: Resummoned after 10 seconds following a death, gaining 1500 HP and +20/+20 attack damage. The Hunger Aura also gains +10% lifesteal. Death Animation: Dissapates into the ground. Appearance: A large black humanoid mass, with long arms, clawed hands, and a spiked head. It lacks feet, having just a single ground connected column. A small storm of black and red swirls around it on the ground. Notes: Killing the shamans generally takes higher priority, but the Spirit should not be overlooked, as its fast speed and healing can run through your defenses. Daemons consumed with a deathly plague. -Plague: Attacks inflict a poison for 2 seconds at 30 d/s. Does not stack. -Engorge: When a nearby Plagued dies, consume the body to gain +350 HP and make Plague's damage increase by +10 d/s. Death Animation: Explodes into slime, releasing an orb of white light. Appearance: A small demon, with a green coloration and a single eye. Notes: The poison can kill anything in seconds. Twisted daemons that feel no pain from pinprick strikes. -Intoxicating Scent: Reduces soldier attack damage by 50% when near. -Feel No Pain: If an attack deals under 35 damage, take no damage and heal for 10% of the damage. Death Animation: Explodes in a small purple explosion, releasing a white orb. Appearance: A medium size demon of a pink coloration and an odd, stretched body. Notes: This thing is the bane of anything and everything low damage, so hit it hard with Sylvan Trackers or other high damage towers. A fog-spawned copy of our soldiers, its very existence is an omen. -Evil Bullet: Fires 3 bullets dealing 9-16 damage each, every 4 seconds. -Evil Charge: Charges at units, stunning them for 2 seconds on contact. Death Animation: Breaks into shards. Appearance: A dark copy of a Zealot, with red eyes and a single sword. Their body is formed of a black fog. Notes: Not an extreme issue, but annoying en-masse. Specialized daemons that can corrupt our men into Eviman. -Corruption: Poisons barracks at 5 d/s for 5 seconds, turning them into Evimen if they die. -Chaotic Conversion: Heals for 100 when a soldier is corrupted. Death Animation: Explodes into a black smoke, releasing a ball of white light. Appearance: Another medium size demon, with black skin and purple eyes. It exudes a purple aura. Notes: No good, keep soldiers away. Massive beasts which exist to cause pain. -Catch: Catches artillery projectiles, before throwing them at barracks, dealing equivalent damage. Can only occur once per second. -Bloodlust: Heals for 40% of the damage it deals. Death Animation: Exlodes into bright red blood, releasing an orb of white light. Appearance: A massive demon clad in heavy armor, with a massive, shoulder-slung sword. Notes: Lots of HP and armor, so use mages. Flying demons with a piercing scream. -Disc: Reconfigures into a disc-like form. This form is stationary, but absorbs all nearby magic to heal itself for 100% of the damage. This lasts 3 seconds, with a 9 second CD. Death Animation: Explodes into blue smoke, before releasing an orb of white light. Appearance: Manta-like creatures with a blue coloration and a larger size than a Cloud Stalker. Notes: Its Disc Mode can be very dangerous in a mage heavy defense, as 400 HP is not low enough to easily burst down in 6 seconds. A Lesser Transcendant, it acts as a beacon to draw other Transcendants to this world. -Beacon: Boosts nearby Transcendants' speed to Fast for 4 seconds on death. -Anchor: Heals nearby Transcendants for 500 HP on death. -Transcend: Spawns automatically when a Plagued, Screamer, or Corruptor is killed. Death Animation: White light erupts from its chest, before exploding, leaving a pile of green goo. Appearance: A blobby humanoid of white light, with black eyes. It has a number of rainbow shards sticking out of its back and acting as claws. Notes: It all comes full circle. Ascended creatures of a higher plane. While powerful, their anchor to this plane is not complete, and thus they are not at full power. -Unanchored: Starts at a magic immunity, losing 1.25% magic resist per 1% HP lost, and gaining 1.25% armor at the same rate. -Psi Explosion: Explodes for 300 damage on death. Disables nearby special abilities for 3 seconds. -Transcend: Spawns automatically when a Fiend or Juggernaut is killed. Appearance: A sharp angled humanoid of white light and with black eyes. It carries a sword of rainbow shards. Notes: Both the Transcendant and the Lesser are incredibly dangerous enemies. Beginning with Transcend, more often that not, they spawn at the end of the track, and, when the faster Lessers are killed, the Transcendants gain the speed and heal, making them even more threatening. Of course, the Unanchored ability also means you need a varied defense, lowering the effective possible DPS. Master of the Transcendants, who dual wields massive swords. -Order by the Sword: Reduces the damage of a tower to 5-10 for 10 seconds. -Cycle by the Sword: Upon casting, ignores the next 10 attacks or abilities. Both abilities have a 10 sec CD. Death Animation: Delivers a death quote before exploding into green goo, but also releasing a blue orb. Appearance: A large Transcendant, with bright blue eyes and shards. Two crystalline swords are its main weapons. Notes: Requires a balanced defense, and its abilities can be quite dangerous. A leader of the Transcendants, who wields a giant hammer. -Stormhammer: Calls down a lightning bolt, which strikes the hammer, reflecting and then hitting every close unit for 100 true damage. -Quakehammer: Shakes the earth, reducing the range of nearby towers by one level. Lasts 5 seconds. Death Animation: Delivers a death quote before exploding into green goo, but also releasing a red orb. Appearance: A large Transcendant, with bright red eyes and shards. A crystalline hammer is its main weapon. Notes: Weak to mages, but beware of Quakehammer, especially when using short-range towers. A leader of the Transcendants, who wields a magical staff. -Staff of Life: Drains 75 life from soldiers to heal all nearby enemies. -Staff of Silence: Silences nearby towers for 5 seconds. Death Animation: Delivers a death quote before exploding into green goo, but also releasing a green orb. Appearance: A large Transcendant, with bright green eyes and shards. A crystalline staff is its main weapon. Notes: Weak to archers and artillery, but still powerful. A god of infinite power, made flesh. Pray that we can survive. Damage: 100-200 against heroes every second; if fighting soldiers, Apotheosis will grab them, one at a time, and then crush them, smiling. This animation takes 1 second. Appearance: A massive Transcendant, roughly 3 times the height of a tower, with 3 eyes - one red, one green, one blue. It has semi-angelic wings and a glowing white body. -Waterjet: Blasts a long range jet of water by holding out its hand. Deals 300-500 true AoE damage. 10 second CD. -Neutralization: Clenches a fist, summoning a skin of water which grant an immunity to artillery for 3 seconds. 15 second CD. -Chaos Field: Snaps its fingers, causing all damage from nearby towers to be minimized for 5 seconds. 20 second CD. -HP Balance: Pinches the air, and then steals 50% of the current HP of all non-heroic units and heals from it. 25 second CD. -Confusion: Holds out a flat palm, silences nearby towers for 6.5 seconds. 13 second CD. -Death Aura: Death aura dealing 10 damage/second. Doubled versus non-heroes. -Absorbtion: Crosses its arms, making it heal for 250 for every special ability cast against it in the next 3 seconds. 25 second CD. -Shield Magic: Waves a single hand in front of its face, shielding it from Mages for 3 seconds. 15 second CD. -Plaguefire: Stamps the ground, creating a fiery aura for all enemies, dealing 10 dps to all units around them. This effect can spread to soldiers and persist. 10 second CD. -Lightning Rod: Plants its feet, before gaining 75% armor and magic resistance for 3 seconds. 15 second CD. -Challenge: Beckons at a tower, placing the "Challenged" status. Unless the tower deals 300+ damage in the next 10 seconds, it will be destroyed. 25 second CD. -Galeforce: Raises its hands, creating gusts of wind which grant an immunity to archers for 3 seconds. 15 second CD. The last remains of the Apotheosis. Appearance: A small, roughly humanoid form of green slime, with an aura of flickering light. Sagate's spell, and its various upgrades, each have different sub-effects, that are cast on random parts of the battlefield. Barrage: Increases attack speed by 15%. 1 star. Composite Bow: Increases range by 15%. 1 star. Perfect Hit: Greater chance to roll higher damage numbers. 2 stars. Powerful Shots: Arrows fired from a Great range or higher destroy 25% of enemy armor per shot. Stacks. 2 stars. Flechette Arrows: Arrows that miss their targets explode into a rain of 10 flechettes, that each deal 1-2 damage. 3 stars. Better Training: Increases HP by 20%. 1 star. Propaganda: Reduces L1-3 barracks construction costs by 10%. 1 star. Testudo: -30% damage from ranged attacks. 2 stars. Defenders of the Faith: Deals 10% more damage per god level. 2 stars. Berserker: When at 10% HP or lower, gains a 25% damage buff, 25% attack speed buff, and 25% armor. 3 stars. White-Hot: Increases burn d/s by 2 point. 1 star. Greek Fire: Increases range by 15%. 1 star. Sticky Fire: Increases burn duration by 3 seconds. 2 stars. Comet's Power: Increases base damage by 25%. 2 stars. Embers: Fires stick to the ground for 2 seconds, burning enemies that step on them. Artillery-sized AoE. 3 stars. Recoil: Slows enemies by 50% for a second in a small area near the tower every time it fires. 1 star. Bigger Rocks: Increases damage by 15%. 1 star. Flexible Wood: Increases attack speed by 25%. 2 stars. Siege Warfare: Increases range by 25%. 3 stars. Demolition Experts: Deals 100% more damage to enemies over 1500 max HP. 3 stars. Smoky Plume: Creates an area of smoke on the ground which slows enemies by 20%. Also adds 2 meteors. 2 stars. Scorched Earth: Does the same as the other scorched earth upgrades. 2 stars. Inferno: Doubles damage and duration of scorched earth. Also adds 2 meteors. 3 stars. Meteor Shower: Fires meteors at random locations in addition to the target. 3 stars. Extinction Event: The main target is vaporized by a giant meteorite. Deals lots of damage, and pushes enemies close to it away. 3 stars. Queensmen: Boosts HP by 15%. 2 stars. Wolfram Gear: Boosts armor by 10%, and damage by 10%. 3 stars. Bleeding Blade: May cause bleeding at 3 d/s for 5 seconds. Stacks. 3 stars. Defensive Posture: Reinforcements gain +40% armor while idle. Lasts for 3 seconds once melee is entered. 3 stars. Crossbow Master: Gains a fast-firing ranged attack, dealing 3-7 damage every 0.75 seconds. 4 stars. This unlocks the God Spell, and is thus the baseline ability. Drawback: -40% damage to Swamp enemies. Tears in Rain I: Reduces Barracks respawn by 1 second, and Reinforcement CD by 2 seconds. Rip Tide I: Decreases the speed of all enemies by 6%. 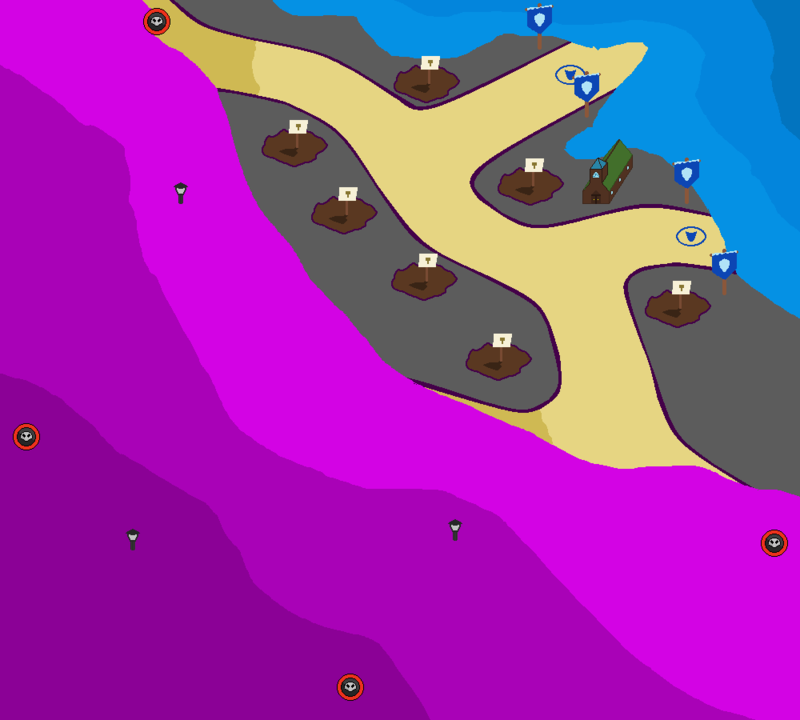 Spring Tide: Pushes enemies for 6 strategic points. Requires Tears in Rain I. Tears in Rain II: Reduces Barracks respawn by 1 second, and Reinforcement CD by 2 seconds. Requires Tears in Rain I. Might of the Sea I: +4% damage for Heroes. Requires Rip Tide I. Flood: Pushes enemies for 8 strategic points. Requires Spring Tide. Tears in Rain III: Reduces Barracks respawn by 1 second, and Reinforcement CD by 2 seconds. Requires Tears in Rain II or Spring Tide. Purify: Cancels out Regnos's Drawback. Requires Tears in Rain II or Might of the Sea I. Might of the Sea II: +8% damage for Heroes. Requires Might of the Sea I.
Tsunami: Big Wave affects the whole screen. Requires Flood. Storm Surge: Dramatically increases damage. Enemies that survive are slowed by 75% for 4 seconds. Requires Flood or Tears in Rain III. Devotion: Applies a 1.2x multiplier to all Worship gained. Requires Tears in Rain III. Rip Tide II: Decreases the speed of all enemies by 12%. Requires Purify or Might of the Sea II. Might of the Sea III: +12% damage for Heroes. Requires Might of the Sea II. Drawback: The damage variance of all allied towers, units, spells, etc. is halved. Weighing of the Heart I: Barracks have a 2% insta-kill chance on each melee attack. Wise Strikes I: 5% chance for a true damage basic attack. Armor Balance: All enemy armor is equally redistributed among all enemies and soldiers. Requires Weighing of the Heart I. Weighing of the Heart II: Barracks have a 4% insta-kill chance on each melee attack. Requires Weighing of the Heart I. Army Balance I: +25% damage for Reinforcements. Requires Wise Strikes I. Damage Balance: The damage of all barracks is increased to that of the highest for 8 seconds. Requires Armor Balance. Weighing of the Heart III: Barracks have a 6% insta-kill chance on each melee attack. Requires Weighing of the Heart II or Armor Balance. Balance Undone: Cancels out Sagate's Drawback. Requires Weighing of the Heart II or Army Balancee I. Army Balance II: +50% damage for Reinforcements. 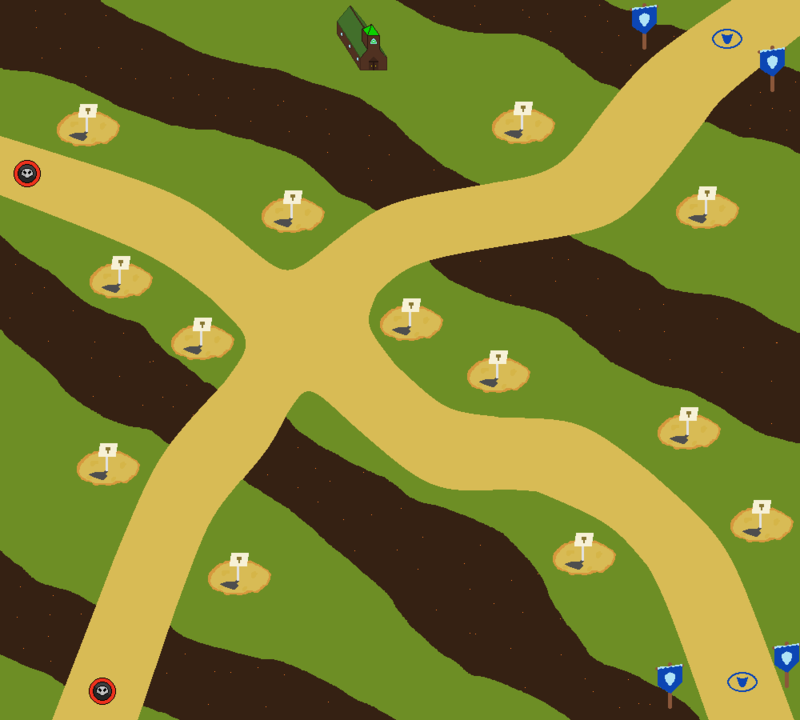 Requires Army Balancee I.
Bounty Balance: Any enemies with a bounty below the average bounty of all enemies on the map have their bounty increased to the average. Requires Damage Balance. Health Balance: All barracks gain the HP of the highest health soldier. This stacks on top of existing health. Lasts up to 25 seconds. Requires Damage Balance or Weighing of the Heart III. Wise Strikes II: 10% chance for a true damage basic attack. Requires Bravery or Army Balancee II. Army Balance III: +75% damage for Reinforcements. Requires Army Balancee II.